Many people in the area around Gatwick have been experiencing more aircraft noise than usual. There has been an increase in the number of flights this summer (including night flights). This has been causing real upset and concern to thousands of people, and worry about what other changes Gatwick has planned, let alone the impact of a second runway. This is a short briefing on what is happening at present – and what people can do. 6. Get active! Oppose the aircraft noise. Join GACC and CAGNE. It is outrageous that Gatwick Airport and NATS (air traffic control) have consulted in general terms but have ruled out a second consultation, with maps, once the proposed flight paths have been drawn up. According to Brendon Sewill, GACC chairman: ‘Some people may benefit from the changes but thousands are going to find themselves under a new flight path, with their peace shattered and their house devalued. But they will be told that they cannot complain because they have already been consulted! What is now proposed at Gatwick are alterations to the existing flight paths. But a new runway would cause far more disturbance – with every existing flight path being matched by another. Consultation in 2009 on changes to flight paths north of the Thames led to over 15,000 objections, and the proposed changes had to be cancelled. At Frankfurt airport new flight paths have led to 75 demonstrations in the past 18 months, some with over 1,000 people. The 5 letter designators of flight paths (ADNID) are locations at which the Standard Instrument Departure (SID) routes end – and planes transfer to other routings dependent on destination. From its coordinates we believe ADNID is actually in Lower Wepham Wood approx 3km east of Arundel. The flightpath going in that direction used to be called BOGNA – as it ended somewhere close to Bognor Regis and the 5 letter designators often had some resemblance to the name of a local geographical location. So KENET wasn’t far from the River Kennet. The older routes had three letter acronyms (MID for Midhurst, CPT for Compton..), but as the number of routes shot up they would have run out of options. Now there is concern that the shortage of 5 letter designators could limit future developments ! This is a 6 month trial, of departures, taking off to the west of Gatwick. It started on 17th February, and so should end by the 17th August. The reason for the increased flights over Warnham and areas further south west is that Gatwick has decided, with NATS (the national air traffic control service) to do a “trial” of this new flight path. The aim of this is to get more planes off the runway at Gatwick, more quickly, so the airport (and the airlines) can make more money. By getting some of the planes taking off from Gatwick to the south west to diverge from the normal departures flight path, they can get the next plane off the runway a bit quicker, as they are not following close behind, with the dangers of wake vortex etc. So the planes are turning left and heading off over Warnham, and villages that were previously overflown relatively infrequently. Gatwick and NATS call this flight path ADNID (they give all their flight paths acronyms, and delight in use of impenetrable gobbledygook and jargon). The ADNID flight path trial allows Gatwick airport to explore whether reducing the separation between paths gives them the assurance that the time interval between flights can be reduced. (It is still not clear what data allows them to make the safety judgement). It also means that all these planes flying south don’t have to fly due west for so long (and it allows them to cut the corner (and save fuel). It is also not clear how this squares with the DfT Guidance to CAA on Navigation which prioritises reducing environmental effects at heights below 4,000 feet, balancing environmental effects like noise, with CO2 savings between 4000 and about 7,000 feet and prioritising CO2 savings at altitudes higher than that. The images (screenshot) above shows what is happening with the ADNID flight path trial. It shows the tracks on 27 June 2014 between 7.30 and 11.30 hrs and shows aircraft tracks as they depart Gatwick in the more normal westerly direction (aircraft have to take off and land into the wind which is more often from the west than from the east). One reason for the intensity of the planes is that aircraft used not to be able to navigate terribly accurately. But now they have something akin to car satnav, called Precision Navigation (PRNaV) and with GPS (global positioning) they can fly a very accurate route, sticking to a track just 30 metres or so wide. So the planes can all fly down the exact same line, while in the past they may have spread out over a kilometre width swathe, or wider. It suits the air traffic controllers to have all the planes down one flight path, as it is then easier for them to control. Hence the concentration of flights. As this is called a “trial” the airport is allowed to just introduce it, with no warning period. The Gatwick Airport Consultative Committee decided that it would be best to give parish councils etc no warning before the trial, in order to avoid to many complaints. [It could be argued that the airport has spectacularly “shot itself in the foot” with this misjudgement]. If there is enough fury by local people, expressed strongly enough, there is a chance that this flight path will not become permanent. However, it is important that as many people as possible, express their opposition to this flight path, as strongly as possible. Stunned and appalled by the new aircraft noise burden imposed on them, people at Warnham, led by the remarkable and dynamic Sally Pavey, set up a local protest group, called CAGNE (Communities Against Gatwick Noise and Emissions). She and her neighbours and fellow villagers have been very distressed to find the peace and quiet of the homes they have worked for years to buy being destroyed, for the airport’s profits. CAGNE has already built up a strong membership and an effective campaign. Because of the degree of upset, anger and despair in the Warnham area, it has been relatively easier to get a lot of people mobilised for action. There are many people in Loxwood, Slinfold and other nearby villages who are part of the CAGNE campaign. Anyone affected by the ADNID trial should contact CAGNE cagnegatwick@gmail.com and join up with them. Due to the extent of the anger and concern about other flight paths around Gatwick, CAGNE has also set up CAGNE East and CAGNE East Sussex. The older, long established campaign group opposing Gatwick expansion is GACC (Gatwick Area Conservation Campaign) www.gacc.org.uk has been campaigning on Gatwick issues for some 50 years. Anyone concerned about flight path issues is encouraged to get in touch with them, and join. The more support and backing GACC have, the better – and the stronger their voice is, both in fighting these flight paths, but also fighting the proposed new runway. The procedure for making the trial flight path route (in this case, the Warnham ADNID trial) permanent is that the CAA has to approve the change. Because it involves a change to a Noise Preferential Route (NPR), for departures, the Department of Transport has to approve too. So its approval is not automatic. The airspace changes outside the NPRs only involve the CAA, as far as we are aware. They could have a serious impact on many towns, villages and rural areas. The affected area is from Guildford to Tunbridge Wells, and from Petworth to Sevenoaks, and could represent the largest change in the noise impact of Gatwick for a generation. GACC (the Gatwick Area Conservation Campaign) has serious concern that these changes could cause great anger and distress. The consultation document is complex, badly written and difficult for lay people to understand. We have asked Gatwick Airport to produce a simplified version, and to extend the consultation period. Both requests have been refused. But how much time must the lay person expected to give to trying to understand this document? It seems unreasonable that busy people, with their own lives to live, should have to sit for several hours, labouring over Gatwick documents, attempting to decipher concepts and terms which, with a bit of planning and ability to write plain English, should have been made clear. The end of the consultation is 15th August. Any change in flight paths causes great distress and anger because the previous peace is shattered, expectations of future peace are destroyed, houses are devalued and people are unable to move and feel imprisoned. People have paid extra for houses that are not on flight paths only to find that new flight paths are being created – without compensation. One of the main motivations is GAL’s desire to get more aircraft off the runway, and thus to make a larger profit. [It is a private company owned by overseas investors.] There is no need for extra flights when Stansted is only half full. No details are given in the consultation of the new point-merge system for arriving aircraft which will affect much of East and West Sussex, and part of Kent. The airspace is being redesigned in ignorance of what causes disturbance. The necessary research has not been done. For example, there is no evidence that concentration will cause less disturbance than dispersal. Ten flights an hour over one person may cause as much annoyance as one flight an hour over ten people. The proposed new flight paths all relate to the existing runway. If ever a new Gatwick runway were to be built, all the flight paths will need to be revised, with new flight paths over areas at present peaceful. So why cause extra hassle now, when there is no urgent need for change? GACC is asking for public meetings to be held across the affected area, so that people can understand what is proposed. The Gatwick Area Conservation Campaign (GACC) has found after years of working on flight path issues, that local residents suffer more from noise pollution than urban residents as they are used to the peace and quiet. The background noise level is higher in towns, so the relative increase in noise when a plane goes overhead is greater in a rural setting than in an urban one. This is a significant difference. It has been acknowledged in the noise regulations used by local authorities. Some of the documents are very large, as well as complicated and not clear. For some of the rural areas affected, the speed of the local broadband is not sufficient to download them. It is an email address that can be used for making complaints about aircraft noise. Such complaints only receive platitudinous replies but they are counted in official statistics that demonstrate that people are annoyed. GACC (Gatwick Area Conservation Campaign) suggest that people should use this means of complaining whenever they are bothered – perhaps once a day. But not so often that the process of complaining further damages their quality of life! Residents might also like to make their feelings known to their Parish Council and urge it to support GACC. Many people are saying that aircraft are causing much more annoyance than ever and are asking what has happened. Those who complain about the narrowing of the departure route will probably be told that it has been done to minimise the number of people who are over-flown. But there is no evidence that this policy is better than spreading the load. Such concentrated noise, inflicted on a small number of people, may well have costly health consequences that exceed the consequences of inflicting less frequent noise on a larger number of people. Nobody knows because no experiments have been done to find out. We suggest people complaining ask for the evidence to support the policy that concentration is preferable to dispersal. 1.Note exact time of aircraft. 2. Ask for written reply. If appropriate, ask for a print out of the aircraft track, and details of its height over your house. 3. If told aircraft did not exceed noise limits, point out that the monitors do not detect all infringements because not all aircraft fly over them. Nor, probably, are the monitors near your house (they are about a mile from the end of the runway). 4. If told that the matter will be taken up with the airline, or with Air Traffic Control, or with some airport committee, insist on seeing response or action from that body. 3.31 The routes used by aircraft and the height at which they fly are two significant factors that affect the noise experienced by people on the ground. Consistent with its overall policy to limit and where possible reduce the number of people adversely affected by aircraft noise, the Government believes that, in most circumstances, it is desirable to concentrate aircraft along the fewest possible number of specified routes in the vicinity of airports and that these routes should avoid densely populated areas as far as possible. This is consistent with the long-standing concept of noise-preferential routes which departing aircraft are required to follow at many airports, including the noise-designated airports. Within the countryside, in common with other relevant authorities, the CAA has legal duties to have regard to the purposes of National Parks and Areas of Outstanding Natural Beauty and must therefore take these into account when assessing airspace changes. 3.32 However, in certain circumstances, such as where there is intensive use of certain routes, and following engagement with local communities, it may be appropriate to explore options for respite which share noise between communities on an equitable basis, provided this does not lead to significant numbers of people newly affected by noise. Whether concentration or respite is the preferred option, those responsible for planning how airspace is used should ensure that predictability is afforded to local communities, to the extent that this is within their control. Further guidance on these airspace matters will be provided when the Department for Transport updates its guidance to the CAA on environmental objectives relating to the exercise of its air navigation functions (see Chapter 5). 3.33 At all airports, the key principle should be that airports act as good neighbours so that local communities have conidence that airport operators take their noise impacts seriously. This requires airports to be open and transparent in their communications. The Government expects airports to help local communities understand these noise impacts and performance against relevant targets or commitments through monitoring, provision of information and communication designed around the specific noise impacts and the needs of the community. We expect airports to select appropriate tools such as noise monitors (ixed and mobile), online information showing aircraft light paths, heights and noise, track-keeping, performance reports and metrics which describe noise in ways which communities can easily understand. We encourage the CAA to consider how it can use its information functions (see paragraph 4.25) to share good practice in how airports monitor, report and communicate their noise impacts. all changes below 7,000 feet (amsl) should take into account local circumstances in the development of airspace structures. The noisiest types of aircraft are banned between 11.00 pm and 7.00 am. The number of flights between 11.30 pm and 6.00 am is limited by a quota – at present 11,200 in the summer (seven months) and 3,250 in winter.There is also a separate quota system based on noise, with noisy aircraft using more points. Aircraft are classified as QC1, QC2, QC4 etc. A QC4 aircraft uses four points and makes twice as much noise as a QC2. A QC2 uses two points and makes twice as much noise as a QC1. There has been a change in classification which makes it difficult to compare past and future figures.The Government has carried out one consultation on the system for controlling night flights. They have now proposed to make virtually no changes until 2017 – see Latest News. In 2006 the Government announced its decision on the number of night flights from Gatwick for the six years 2007 – 2012. The number of night flights remained at roughly the previous level but there was a gradual 10% reduction in the amount of noise permitted at night. The noisiest aircraft were banned (except when delayed). GACC welcomed this small improvement. GACC press releaseGatwick has more night flights than Stansted, and twice as many as Heathrow. The total level of noise permitted at night each year at Gatwick is greater than at Stansted but less than at Heathrow. Please support GACC by becoming a member. GACC is a voluntary association, with an executive committee elected each year at our AGM. Care is taken to ensure that our committee includes representatives from each area around the airport, and that each committee member is prepared to work for the general public welfare of the whole Gatwick area. Send us a subscription or a one-off donation – we would welcome your help. As a member you will be able to attend our AGM and vote for who should serve on our committee. and we will send you full membership details. CAGNE was formed out of residents’ outrage at a new flight path being implemented over their homes without consultation on the 17th February 2014. 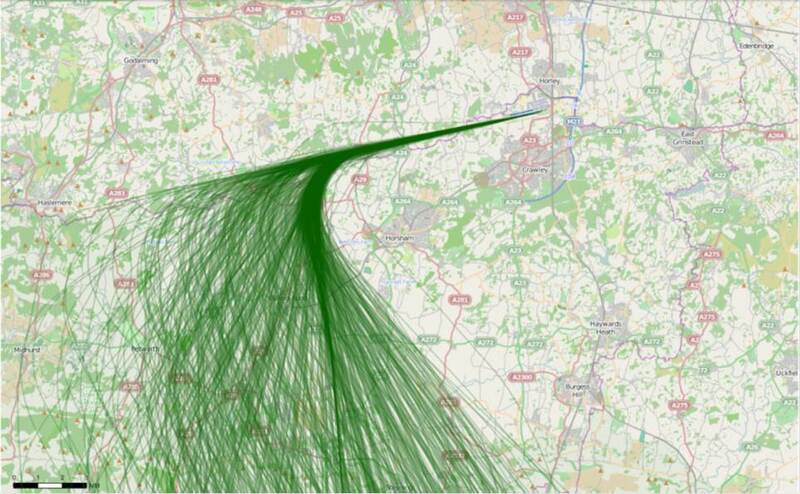 CAGNE aims to inform and share information between residents on the new flight paths out of Gatwick Airport. CAGNE does not support a new runway at Gatwick Airport for many reasons such as lack of infrastructure to support an airport the size of Heathrow, and it will bring an even greater number of new flight paths over areas not previously over flown before. CAGNE is a forum for concerned residents to exchange information and has individual smaller groups working to raise awareness in their specific parish. CAGNE is free to join and has members from Warnham, Rusper, Kingsfold, Rowhook, Broadbridge Heath, Slinfold Parishes plus areas of North Horsham.